there are hardly any thoughts not already written. and eyes that need showing. I live in the 21st century. A touchy world where, despite the fact that we live in civilised democratic societies, black souls are fighting a constant fight towards emancipation, red souls are limited to their government assigned native lands, brown souls are lost in translation, and yellow souls are fighting the tide that groups them as the new money trends – all while the white souls have proper identity. Germans, Swiss, Italians, French, Americans, Austrians, Australians – the list goes on. The white souls have been brought up with the memory of the horrors of the Second World War. Some of them grew up with the knowledge and it became somehow their “second nature” to be very aware of discrimination such as racism and fascism wherever it manifests. For the white souls are naïve believers that nothing can be worse or even comparable to the horrors of the Second World War. They are protected in a bubble of their making – a bubble that says, “Nothing can be as horrible as it was during the wars.” This often manifests in forgetting those painful memories of wartime, and repeating mistakes that shouldn’t be repeated: new time, new appropriations of the word “war.” Most of the Western civilisations live in functioning democratic societies where the weapon of war is no longer physically deadly like guns and torture chambers. War weapons of our modern day society are words, body language and expressions. These can wound people deeply and even psychologically. Thus, amidst this world dominated by the white souls, and myself – a brown woman – there is forever an unasked question: unasked by those who are diplomatic and have a sense of elegance; while most people refrain from asking due to the difficulty of framing it correctly. All, nevertheless, try to find a way around it. They approach me in a half-hesitant sort of way. They eye me curiously or compassionately, and then instead of saying directly: “How does it feel to be a foreigner?”, they phrase it in steps. ‘Where do you come from? I know an excellent Indian restaurant in my town; or, I love Indian food; or, it is so colourful in India; or, such a beautiful culture; or, don’t you miss home?’ At these I smile, or am interested, or reduce the boiling to a simmer, as the occasion may require; to the real question, “how does it feel to be a foreigner?” I rarely reply. And yet, being a foreigner is a strange experience, particularly for someone who has never been anything else. The otherness that goes with being foreign is something that has been a part of my experience even at childhood, in my country of origin. Apart from being brown – I am also a woman. It was in the early days of carefree childhood that the revelation occurred. Differentiation. I remember well when the burden of reality hit me. I was a little thing, wandering in the world of daydreams, with Misha comics open in front of me. My maternal grandmother came in with a bag full of wooden toys. At my grandfather’s request, she handed me two and sat down to carefully pack the rest. When I asked her for one more from an array of about thirty wooden toys – she refused definitively, without even a glance towards me. When grandfather insisted – she replied “It’s is for our son’s daughter. Not our daughter’s daughter.” Grandfather nodded in agreement. Then it dawned upon me with certain suddenness that I was different. The “other” granddaughter shut out from their male dominated world by a vast curtain. From then on, I had no desire to tear down the curtain, or to tiptoe around it. I kept my distance and watched over the years with fascination – how different I am or rather how different I was made to feel. I’d often get tired as this differentiation was not simply at home. Cultural capital and economic capital are certain things that define posh – particularly in a top-notch all girls’ school. Especially when one’s parents refuse to bring one up in a way that would turn one’s head, and build one to be a nonsensical nincompoop ever so content about family history, daddy’s monthly salary, mommy’s wardrobe and potential bethrove. My days otherwise overshadowed, on rare occasions would turn brighter when I could answer a teacher’s question perfectly, solve a math problem correctly, or get to walk around the school garden in peace – alone. This is a peculiar sensation – where this duality of gender and colour made me see myself through the eyes of the onlooker. Measuring my self-worth through the tape of a privileged world that looked at me with amused contempt and pity. Much more so as I moved out of my third world city of Calcutta – whose poverty did Mother Teresa jolt up a few notches to make famous. I confronted perceptions of the world where my otherness – that of a brown woman – remained reconciled. Brown. Woman. Two souls, two thoughts, and two ideals – trapped in one body, whose fierce strength alone keeps her from being torn asunder. Despite being born in a 5000-year-old culture and civilisation – I often found myself being considered less than civilised. Surprising all with my table manners, my taste, my spoken English, learning ability and politeness. As much as it was a surprise, it was also an annoyance – for the white world attempts to negate brown civilisation and history. Brown history is the history of survival, a constant strife of surviving colonialism for over five hundred years. The brown world is neither strong like the sons and daughters of the night nor dominant like the children of the light – this dirty world is still savagely trying to survive exploits that left it hollow, crushed and confused: so confused that they worship the goddess Durga and yet makes sure a boy child is prized over a girl. A brown woman is a product of this male dominant brown world. She is not advancing into the world to spread her colour; for there is so much that this world can learn from the unity of all the colours! A brown woman will not bleach her brown soul in a flood of white west, for she knows that her culture has a message for the world as much as every other culture does – a brown woman is simply getting out to the world for she has the opportunity to learn and teach, to have an opportunity to work, or simply be a homemaker as she stays a supportive partner for her brown man. However, there is one truth, she simply wishes to make it possible for other brown souls to be both Brown and Human. Without any repercussions from the crushing white walls and without having to worry about doors of opportunity being slammed shut in her face. The motivation that drives a brown woman in this world is the hopeful optimism to be allowed as a co-worker in the realm of civilised democratic societies, to escape both the death and isolation of her native culture that anyhow treats her with “otherness”, to wife-partner-colleague or, to befriend and use her best knowledge, and her latent genius. For unlike the white souls, these brown women are taught to be docile, submissive, the honour of the family, a deity; basically that creature with the purpose of being put up on a pedestal. Therefore when a female tries to break free from these labels, this imprisonment through being put up on a pedestal, as imposed by the Indian society – they are often called names, derogatory in nature, inflicting shame. A faint lingering of the past where these same brown women were epitomes of intellectual and spiritual attainments, flicker a dilemma in their momentarily questioning minds; for to question any man is already her crime. Here in Europe, in the few decades since the World Wars, the brown folks turning hither and thither in uncertain and cynical striving, which often made their very strength lose effectiveness – to seem like absence of power, absence of organisation, absence of focus – like dimness, or even to a certain extent, dim-wittedness. And yet, it is not dimness or dim-wittedness, this cynical striving is more like an inconsistency of double aims. The double-aimed struggle of brown people — on the one hand to escape the contempt of their country of origin by making enough money to send back home, and on the other hand struggling through white contempt for having the knowledge and skill-set that allows them to be hired in reputable establishments with well-paid positions. There are some who are highly liked by the white folk – these are the workers at petrol stations, kitchen hands, cleaning personnel, cashiers at grocery stores, ticket-sellers and the general poverty-stricken hordes working to make ends meet with half a heart due to their painstaking awareness of being the “other,” Some of these folk are highly educated – yet their educations remain unrecognised because their country of origin is considered inferior. The system is only made for the rich browns, who can start all over again and have means to fight – a willing family, and old money. In all of these issues, the brown woman remains silent. In occasional cases where these women reach a certain status and class through relentless hard work, education and patience – her angry colleagues would bully her, pull her down, and discriminate her. Any angry outburst from her will only be counted and held against her. A brown woman is not given the divine right to question. As if it was not enough to face a world tempted toward quackery and demagogy, the criticism of both the white and brown worlds, toward her strong ideals would thus make her question her self-worth! Words. Modern war weapon are words. I remember reading about the people of the Solomon Island. The power of words is such that instead of cutting down a tree, the inhabitants would gather around a tree trunk every day, chanting out their negativity through accusations, curses and derogation towards the tree. After a while, the tree would start to wane and eventually die. The psychology is the same with people, especially with coloured folks and brown women. Whether a brown woman is killed in her mother’s womb, or killed during dowry harassment, burnt alive with her dead husband on his funeral pyre, brutally beaten up with charges of witchcraft or killed with words, anyone of a privileged position is a murderer when they destroy the potential of a brown woman’s soul – a brown woman’s life. This apart, the western brown woman is confronted by paradox. The knowledge that her people are given a twice-told story appropriated and revised by her white compatriots, modified to befit their comfort. Absorbing that what is befitting to their bubble of happy privilege and ignoring the strife of these “others” and their “otherness” that cause them discomfort. The western brown woman are seeing their men not protesting, for these men travel in their brown groups – mixing with their Brown fraternity, partially understanding the implication of words spoken in quackery and demagogy; for these men have a great support, the silent wives who keep their homes straight, – happy and functioning, devoid of outside harassment. These simple, silent wives are often happy with the little that they get – the little pleasure of being able to take a walk alone down the streets of a western country at midnight without perils. The respect and envy of other brown women left back in their home country. Yet, there is a certain discontent. The western brown women, often being the educated women who followed orders and married according to what the family arranged – these women live with the knowledge that would teach the white world about her folks, and yet knows how incomprehensible and whitewashed the history of her own flesh and blood is. How much she is still expected to remain mute and blind, in the supposedly free world of the western lands. The melancholy of this felt paradox is what makes the souls of these brown women a beautiful abstraction. Brown women have contributed greatly to science, and yet these powers of body and mind have in the past been strangely wasted, dispersed, or forgotten. The shadow of her past flits through the tales of the Vedic age, more than 1,500 years ago, where brown women were assigned a high place in society. These women shared equal standing with their male counterparts, had liberty that truly had societal sanctions and yet these liberties had loopholes that made sure these women were tamed. This dichotomy is seen with the ancient Hindu metaphysical perception of “Shakti”; the feminine principle of energy, multitasking and strength was consequent and synonymous with brown women of the Vedic age. This took the form of worship of the female idols by Hindus. Yet today, through history, the powers of brown women flash here and there like falling stars, and die before the world has rightly appraised their brightness. Occasionally, there comes a rebel. A wife who wishes to express or a girl who wishes to articulate her innate love of harmony and beauty that set the rougher souls of her people alight in mockery. And yet, all of these issues manifest a good amount of confusion and doubt in the soul of the brown artist; for the beauty revealed to her was the soul-beauty of a race which her larger audience despised, and she could not articulate the message of her people – to her people of both western and eastern worlds. This waste of double aims, this seeking to satisfy two ideals that cannot be reconciled, has shaped a sad chaos within her, with the courage and faith and deeds of billions of her people — often wooing false gods and invoking false means of salvation, and at times, has even seemed adamant about making these brown women feel ashamed of themselves for normal human actions, such as endeavours to bring back the baton of light and knowledge to her brown folks. The days of oppression are not over for these brown women, and some wish to see that one divine event that would culminate to the end of all doubts and disappointments; few races around the world ever had the courage to worship nonconformity with half such unquestioning faith as does the educated and self-dependent western brown women. To her, so far as she thought and dreamed, colonialism was indeed the sum of all villainies, the cause of all sorrow, the root of all prejudice; independence was the key to a promised land of sweeter beauty that ever stretched before the eyes of wearied Indians. Yet, incitement swelled one refrain – emancipation. In her tears and curses at all manner of gods, she implored to have freedom in her right hand and equality in her left. She is still waiting. A sense of belonging is that absolution one needs to truly belong somewhere. A sense of belonging is that absolution that depends on welcoming language. That some of us are still fighting. A sense of belonging is that absolution, in search for a loving home. 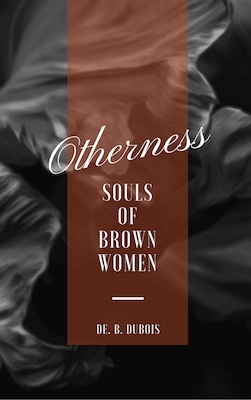 “Otherness: Souls of Brown Women is a book that sheds light on the plight of the brown woman, not just on her but all women since no matter what our color we fight similar battles. It is a book that made me sad and angry, giving facts and details of how little progress we woman have actually made in the past century. It tries to see the light at the end of the tunnel. Hopeful yet pragmatic it ensures we sit up and take notice of the #otherness we all face. It speaks of the fight for survival women face even before they are born. The fight continues till the end, each step is hard to take, each victory through a lot of sweat and blood. The worst enemy of a woman is more often than not another woman. We know of many such instances where a woman stops another from succeeding or achieving something. It is a book that speaks to your heart. It is a reflection of the inner turmoil and obstacles we woman often face. In India, we are no strangers to the discrimination faced due to skin colour and herein lay the strength of this book. It lays bare the prejudice we will face when we go abroad since we are all brown women. Not white enough for the whites there. Sharp crisp sentences, deep thought, and detailed research make this a crisp and detailed book. The writing is flawless and point on. The author uses her words with conviction and knowledge. The references to the articles and news about atrocities towards women make it so much more real than just a book. It is an homage to women everywhere. “Alarmingly clear reflection of society! Being a brown woman myself in a foreign country, I could easily relate to and understand the author’s narrative where every minute is a struggle to adapt, a struggle to adjust according to your surroundings to blend in. Blending in has been what has always pushed the brown women. Blend in with the mentality of the society, to the family norms...the list continues. As a matter of fact, brown women face the bias with regard to their skin color even in their own homeland-- a constant reminder from family, society, matrimonial market etc. But there is one mention in the book that I don't agree with. The Vedas in their true form have held women in high regard or we wouldn't have goddesses and deities still worshiped. The interpretations and other works which followed suit often had subtle changes brought in by the men who wrote it. The physical strength and the superiority they felt had to be manifested in the society. What better way than transcribing or interpreting something powerful as the Veda? Well, I am no pundit, but from the limited knowledge, I got from articles I read or speeches I heard by people who know their Vedas, mentioned how the outer world actually influenced what was once the most balanced society gender-wise. Once there was a society where women chose their partners and the family name was transferred through the mother. Women were the heir of the family. Yes, I am talking about the matriarchal society which has become almost extinct now. Though some of the customs are still practiced in Kerala, they are near extinction. Once these brown women held the complete power of the family, which in turn was a strong foundation for the society. One of the oldest civilizations dating back to 3000 BC would not have survived and achieved glory without some concrete balance between the genders. Back to the book. I have seen, heard and known these issues faced by colored women and the very plight of brown women which is mentioned in the book. And as we read, we realize in no soft terms, the compromises brown women have to make every day to suit the demands or expectations of the society. For every blow to a brown women's soul, we, brown women have a mark to prove it. “First of all “Otherness – Soul of Brown Woman” is not a story. It is a recollection of author’s past experiences in and around the world, where a person is judged and discriminated based on gender, skin color, nationality and many other things. The first half of the book consists mainly of author’s personal experiences at various stages of life while the second half, actually a major portion of the book consists of list of links to articles collected by the authors in past thirteen years, which shows how a woman is oppressed, denied her rights, tortured, molested and denied justice. The author’s main inspiration for writing this book came from W.E.B Du Bois’ The Souls of Black Folk which sums up the struggle and pain of 20th century colored Americans. “Definitely not what I had expected. Powerfully penned, this book will bring out all those deep-rooted anger that had once consumed many Indians living abroad. I have lived all my life in Europe before moving to The States. I won't say I have faced any of the situations Ms. Dubois has mentioned in this book, but yes, that underlying feeling of not belonging always stayed with me. I, personally feel a brown woman starts feeling this acute sense of not belonging from the time she leaves the threshold of her parent's house. But then we are so used to it, we forget that this is not the norm that the others face. Ms. Dubois has raised many questions in this book which made me think - was I always feeling this controlled - by my family or the society at large? Simple things like voting, education or even choosing my life partner - was this never my birthright? Did the brown women of my past generation fight for my rights? My rights - that I always take for granted.